As CNN continues to try to figure out how to compete in prime time, the network recently announced that former New York Democratic governor Eliot Spitzer and Washington Post conservative columnist Kathleen Parker will soon launch their own show, a roundtable discussion of ideas set to air in the 8PM (read: O’Reilly and Olbermann) slot. If CNN truly believes that the key to winning the ratings war is to be the news-centric antidote to the partisan opinion-mongering on Fox News and MSNBC, this is not really the way to do it. This new show is set up to run on ideological clashes. It looks like Crossfire Lite. Dan Kennedy has one great idea — a version of the highly acclaimed CNN International that focuses on, shockingly enough, the news. (Read some more of his smart thoughts about CNN.) But I have an alternative suggestion. For a long time, Jeanne Moos — known for her quirky, offbeat news packages — has been one of my favorite CNN correspondents. (And as someone who used to watch CNN for almost four hours a day at my old job, I know from CNN correspondents.) Her segments are a refreshing complement to the standard drudge of news readers and punditry. If you think about it, Moos may be CNN’s most unique asset. Why would this work? Look at “The Daily Show” and “The Colbert Report.” One great thing about those shows it that they give people the news with a spoonful of sugar. The programs are so entertaining, you almost don’t realize that you’re getting caught up on the intricacies of Congressional debate or being exposed to the hypocrisies of political rhetoric. In an era where those shows can win viewers – and influence – by virtue of blending irreverence with information, why can’t someone like Moos tap that market, while bringing the gravitas of a credible journalist (check out her international reporting chops) to the table and tamping down the hipster snark by a notch or three? The fact of the matter is, CNN needs to do something bold. It is not going to capture the prime time audience by serving up some network TV newbies in an ideological face-off. It needs to distinguish itself. So (and the same argument could apply for “CNN International”) why not look within at what already makes it unique? Is that President Obama in the video for “Whoomp! There It Is”? I know this idea has an Olbermann’s chance at an NRA rally of becoming reality, but it reflects my belief that news organizations need to not only push the envelope, but invent a whole new kind of envelope in order to succeed — and make it worthwhile to us, the viewers. Richard Julian called me evil before we even spoke. Hopefully not before June 30, when Julian hits the Lizard Lounge in Cambridge. 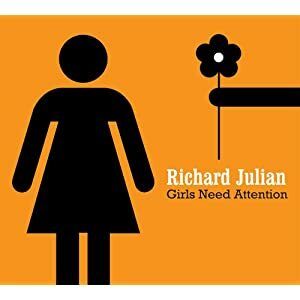 Julian’s latest album boasts inventive, compelling songwriting (with guest turns by Jolie Holland and Wilco’s Nels Cline, among others), as well as unsparing post-relationship catharsis, of which “Georgie” is exemplar. But it is by no means a mopefest. It is by turns witty, biting, reflective and warm. Think Mike Errico, Tom Thumb or Randy Newman (whose “Wedding in Cherokee County” he covers). His range is impressive, spanning from the pensive “World We Made” to the upbeat pop of “Lost in Your Light” to the bluesy riffs of the title cut to the embittered “Words.” It makes sense, given the varied company he keeps, including stints touring or playing with the likes of Bonnie Raitt, Josh Ritter, Norah Jones, Suzanne Vega. When I called him on a recent Tuesday evening, I caught him by surprise. He’d forgotten our interview. “I’ve been managing myself these days, and a few things have slipped through,” he apologized. Julian had assembled some friends for a dinner party. “I’ve got a chicken sausage gumbo sitting here,” he said. Food and drink are as much a part of Julian’s life as his music; he’s working on a web video series (not yet online) that brings musicians and meals together, and he blogs about tequila and other fine spirits at The Brooklyn Lime. Julian is very much a man interested in exploring his appetites, and the place where they intersect is one where he is comfortable. “She looked like a fresh piece of cake,” he sings in the new album’s title track, a line that always makes me laugh. Julian graciously paused from dinner party prep to give me some attention and Take Five for Safe Digression. This is a very, as you’ve put it, confessional album. How do you reach that point of comfort with songwriting and performing – or is it really comfort at all? The only thing uncomfortable about it sometimes, anything you put out there, any piece of art — a painting, a song, a symphomy — is that it is left open to interpretation by everyone. I guess in some cases, the more literal things get, the more strange it can be to hear other people’s interpretations. In some ways, you have a very literal way into something and you realize that all of this stuff is literal, it can still have a life of its own anyway. It breaks down the idewa of what really is literal anyway. If what you’re telling comes from some kind of truth and people interpret it as fiction, then what is it really? What is truth and what is fiction? The things that inspire you to write a song aren’t necessarily the things that are happening to you every day. When you write really confessionally, they get a sense they know who you really are, and sometimes they don’t because they’re only connecting to this one thing. In a way, it’s an incredibly honest way of putting yourself out there, and in another way, it’s ironically misrepresenting. Randy Newman thought people could get more of a sense of who he was from his songs, because of the distance he puts between himself and the characters in his songs. He thinks that’s more revealing than the literal and confessional. You’ve worked with a long, impressive list of musicians. But who’s the unsung hero among those who have inspired you as a songwriter? Frank Tedesso. He’s very obscure to the public, but he had an influence on me and probably a lot of people who’ve been in touch with his music. I moved to New York when I was 19 and I was wide open for getting my mind blown because I’d grown up in Delaware and grown up listening to FM radio in the car on the way to school. I expanded away from that. Frank was one of the first guys I ever saw laying out things in a poetic way and personal way and doing it with a lot of potency, in a similar fashion to what we were just talking about, something that’s really close to the bone and doesn’t shy away from being sad or alternatively happy or funny, just existing in all of those places at once. So, you have a song called “Georgie,” which is my name, even though it’s spelled wrong. But while it’s a bitingly funny song, it’s not very flattering for its namesake. Can you tell me a little bit of the story behind this song? (laughs) The song tells a story by itself. Most of my songs, that particular one, I remember I was out in the woods in Oregon writing that tune. I was doing a song clinic out there. I was using the tune as an example of how to write. It’s a song about being in love and having your lover not be treating you right and you keep loving them out of reflex or hope it will get better. You recognize these things and you see them but it doesn’t make it any better for some reason. By being a musician blogging about tequila, you seem to have struck on a natural pairing. Can you talk a little more about the connection between fine dining and good music? I understand you also have a web TV show that explores this a bit. The show is called “A Groovable Feast.” I go around with musicians and we eat food and play music. It’s kind of abstract. It’s funny, I think, and it’s very musical. There are some very good musicians on it. (On the similarity between musicians and restaurateurs) Being a musician is like running an independent business. Most of the restaurants I go around to, I always take a certain kinship there between someone who is a risk taker, someone who’s creative. I think there’s definitely a lineage there. You’re coming to Boston. Have you been here much before? Any favorite restaurants? I get up to Boston a lot. There’s a little place I like to go before the gig, it’s in Cambridge. Central Kitchen. They’ve got good tequilas there and good bread. Great mussels. After eating his mussels, Richard Julian performs at the Lizard Lounge, with Amy Correia opening, on June 30. Tickets are $10, $12 at the door. 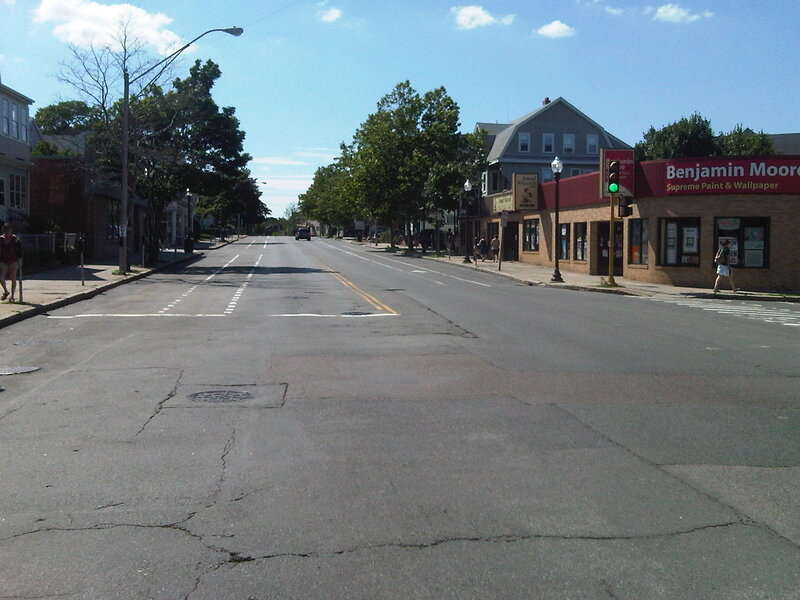 We then planned on visiting SomerStreets on our way home, eager to get our dose of fun Somerville community programming after missing the farmer’s market this morning. We saw a bunch of families taking in the jazz concert in Powderhouse Park, and ways down Broadway we saw the annual Family Fun Day at Trum Field drawing a good crowd. But in between? This was around 3:45. Granted, the event ran from noon until five (flier 1 | flier 2 [.pdf]). But at the time we were there, we saw an extremely small number of people out and about between Trum and Powderhouse. As we walked down the sidewalk and wondered out loud what the deal was, a guy walked past us and snarked, “Your tax dollars at work.” Apparently. The first Somerstreets event, last month in my neck of the woods in Winter Hill, was an apparent success. But while the programming bookending the SomerStreets area seemed to be going well, the vast, vacant boulevard separating the two hubs was a bit depressing. And the number of police on special details minding the road closures and directing traffic did make me think about how much it was costing to essentially have a giant, empty roadway. I wondered about the effect on area businesses, as well. This program allows residents to explore the City by shutting various streets to promote safe walking, running, biking routes in various locations throughout the City. But it seemed to both my husband and I that there needed to be more programming happening on the roadway itself, not just at Trum and Powderhouse. Maybe some historical exhibits or talks, representatives from civic and city organizations, biking demos/workshops or local bike shops showing off cool/vintage bikes, local eateries offering samples of their fare, musical performances, dance troupes, street chalking, fitness/health exhibits… the list goes on. Just walking from Powderhouse to Trum, we came up with at least a dozen viable ideas that would have drawn residents to the area and involved local businesses into the event. All we saw was a kiddie choo-choo listlessly ferrying people up and down the blocked-off stretch of road. Don’t get me wrong. If there’s one thing that Somerville is not short on, it’s amazing civic programming that champions local business and the arts. 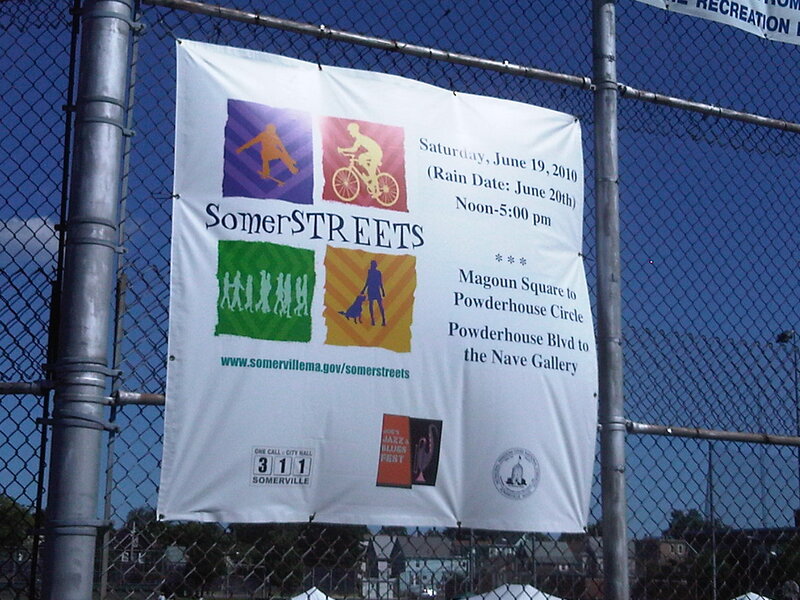 I applaud the city for the SomerStreets initiative, and encouraging fitness and community pride. I just think this afternoon’s event fell a bit short. Perhaps the planning was rushed or the beautiful day drew people to less urban environs. 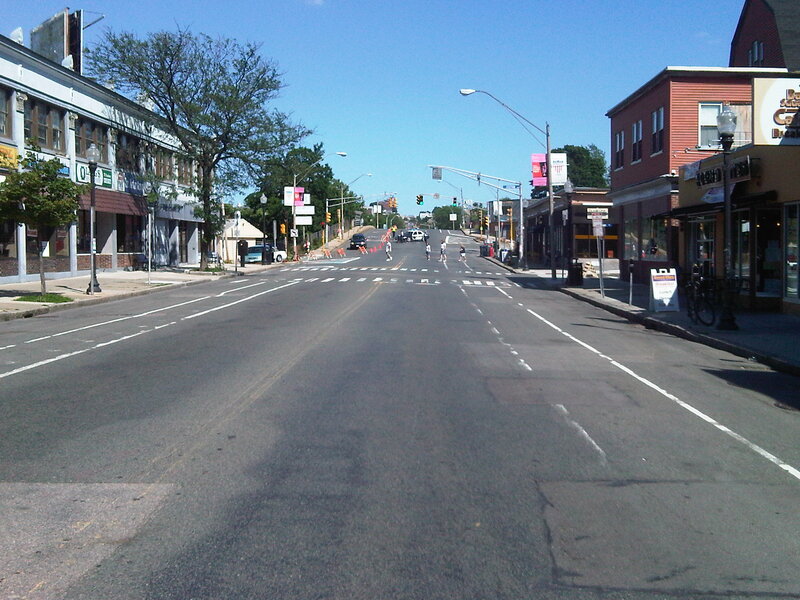 I hope to see future SomerStreets events — the next one is said to be on July 25 — be great successes. Thanks to a tip from Ryan of Ryan’s Smashing Life, I grabbed the most recent Static of the Gods album “Knowledge Machine” free from their Bandcamp site. I am listening to it as I type, and while I had been unfamiliar with the band before, I am absolutely loving them now. Appropriate parts shimmer, grandeur and pop-rock splendor. Jen Johnson’s powerful lead vocals really drive the record — imagine Karen O with a smidge of Asobi Seksu’s Yuki Chikudate, and a little Emily Haines snarl thrown in for good measure. The bad news is, it’s no longer available for free. The good news is, it’s still awesome and at $8, worth the download. Plus, they’re playing June 25 at the Middle East Upstairs. In the meantime, have a listen. This week, I picked up the new Pernice Brothers, “Goodbye, Killer,” and the new We Are Scientists, “Barbara.” I highly recommend following @ashmont on Twitter — Pernice’s manager (and co-author) Joyce Linehan — if you want an ongoing backchannel to your listening experience (and to experience in real-time the barbs that led to the companion book “Pernice to Me“). Want to preview the album? You still have a few days to do so for free via Spinner. Amazon MP3 offered a deal earlier this week — the new Mates of State cover album, “Crushes,” for $2.99. That deal has since ended, but the 10-song set is still available for affordable download at a tidy $5.99. Artists covered include Fleetwood Mac, Tom Waits, Dear Nora and Girls. Freedy Johnston is playing in Somerville on Saturday night, at the Rosebud in Davis Square. A year ago, on June 17, 2009, I saw Freedy Johnston for the first time, also in Somerville, after nearly 15 years of waiting. The show blew my mind. It was everything I hoped it would be and more. I am unsure if I’m able to make it to this Saturday’s show, but you should definitely go. Brett Rosenberg will be opening. It’s $12. And when it comes to singer-songwriters, Freedy Johnston is a living legend, no exaggeration. Go. Want a bunch of tracks from the upcoming Arcade Fire album, “The Suburbs”? Music For Kids Who Can’t Dance Good has what you need. Hallelujah the Hills has released two new, free tracks ahead of their summer tour, which comes to Great Scott on July 8. True power pop is rueful and celebratory at the same time, glorifying desire and frustration, which is why so many power-pop songs concern themselves with the subject of Tonight, or Tomorrow Night, or Saturday Night, or some other night that will only be perfect for as long as it can be deferred. Stay tuned next week for the beginning of something special! I always rue my hasty decisions. Back in the day (“the day” being college), I loved Josh Rouse. I drank up the singer-songwriter-y glory of his first two albums, “Dressed Up Like Nebraska” and “Home.” I still remember seeing him live at the Middle East Upstairs — was that my first solo rock show? — and him complimenting my old R.E.M. Tourfilm shirt. Then, he relocated to Barcelona, and the heavy Spanish influences slipping into his music didn’t appeal as much to me. So I slipped off the Josh Rouse radar, and actually ended up selling a few of his more recent albums. Then yesterday, while driving back from Connecticut, I heard a recent song of his on WERS, “I Will Live on Islands.” And I really, really enjoyed it. I Am Fuel, You Are Friends has some interesting thoughts on Rouse (plus some more MP3s), obviously exhibiting more patience and worldiness than myself on the matter. This weekend, I lost my Foursquare mayorship of Newbury Comics. On the other hand, I earned Foursquare mayorship of Planet Records. I won’t go on about web-ly things (that’s for my other blog), but I will say that everyone freaking out about the uselessness of Foursquare needs to calm down. All it is, for me, is a casual gaming overlay for my everyday life. It’s not going to make or break anything, but for an average person, it can be a bit of fun. And for businesses, there is definitely a potential — if well executed — to use it to take advantage of consumer loyalty. When I earned my mayorship of Planet Records, one of the last vanguard of standalone used CD/record shops, I was excited. Why? Because I felt more invested. Earning that meaningless, imaginary title upon stopping by to purchase Warren Zevon’s “Excitable Boy” tethered me more closely to the store, and will probably make me more likely to stop by and browse when I’m next in Harvard Square. Sure, you can say that mayorships and check-ins and what not aren’t real. But maybe they are. Foursquare, for all of its virtual goofiness, is grounded in real-life, brick-and-mortar transactions and events. And brick-and-mortar institutions like Planet Records are ones I would like to see stick around for a long time. Let’s see what happens when two worlds collide. I have to admit: I bristled a bit upon reading Frank Yang’s recent post about the New Pornographers, wherein he lauds their most recent album “Together” as a “rebound” following the “staid” and “disappointing” “Challengers.” For the record, I absolutely adored “Challengers,” in part because of its indulgence in thoughtfulness and reflection. I couldn’t help it. Those types of songs appeal to me deeply. It’s what makes songs like “The Bleeding Heart Show” and “These are the Fables” among my all-time favorite NP songs. But even Carl Newman admits that “Challengers” faced a backlash because it went so sharply in that direction. But “Together,” as Yang explains, hearkens back to the jubilant, frenetic pop of “Electric Version.” It is arguably the fullest realization of the NPs to date, and I’ve come to terms with the fact that “Challengers,” which I adore, was likely a transitional aberration. And after some initial resistance, I am remembering that even “Challengers” was a grower on me, and I am embracing “Together” for what it is. Relatedly, the New Pornographers’ Kathryn Calder is coming out with a solo album this summer. Stereogum has the details and a free track. I can’t go due to a previous commitment, but I urge you (if you’re around Boston) to go to the debut show in the Mixtape: Boston’s Year in Rock series this Saturday at the Rosebud in Davis. The series kicks off with a fine year, 1993, and features The Luxury, The Rationales, St Helena and Exile in Somerville (members of Apple Betty, Kingsley Flood, Dark Martini & the Dirty Olives, The So-So’s) covering songs from that era. Go go go go go. My friend Annie creates a mix for a friend going through a bad breakup, themed around the Kubler-Ross grief model. Largehearted Boy compiled a list of freely available MP3 compilations for download. I was lucky enough to win tickets to Tuesday’s sold out Stars show at the Paradise from Clicky Clicky. I still remember how I first discovered Stars — I pulled their album “Heart” out of a giveaway box at a radio station my friend worked at. I liked the simplicity of the names of both the band and the album. Who knew that album would grab me and never let me go? I had never seen Stars live before, and they didn’t disappoint. 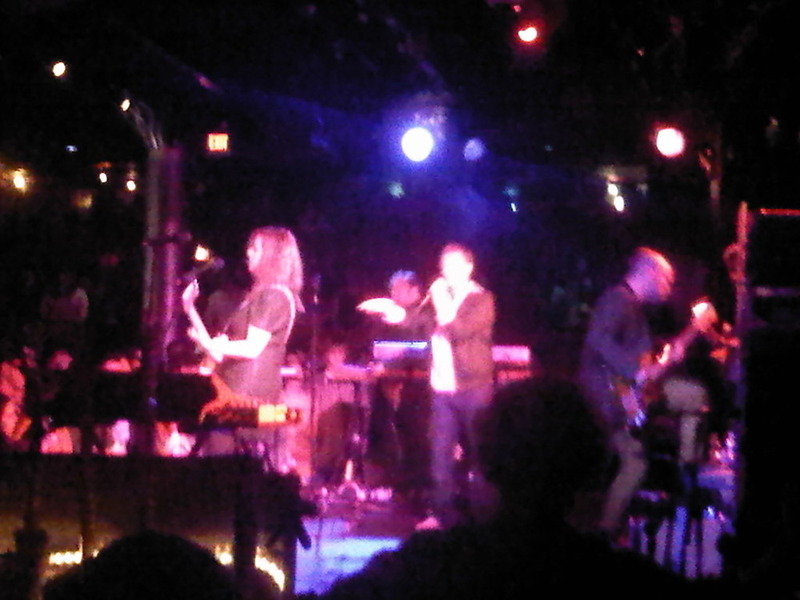 The first half of the show featured their new album, “The Five Ghosts,” played in its entirety. It’s a fun, danceable, synthy affair that I can’t wait to crank up this summer. Then, after a short break, they played a string of hits which they said were selected by the fans, including “Ageless Beauty,” “Elevator Love Letter” and “Your Ex-Lover is Dead.” The crowd was great and supportive, the band was excited and energetic, and the show was simply a joy. Throughout the evening, the band tossed white roses into the crowd, as if we were the ones being feted. Frank Yang at Chromewaves gives some background about Stars’ decision to extensively tour on the album before it was even released — not to mention playing the whole thing in a block with no one having heard it before. They’ve also opened up one of the tracks from the album for remixing, and will feature what they declare to be the best one. Sure, Stars have gone about things a bit unconventionally, but you know what? No one in the sold-out Paradise Rock Club seemed to mind. On Sunday, May 30, I attended the Boston Rock BBQ, a gathering of local musicians, bloggers, publicists and others invested in the local music scene. It was held at the Bridge, a recording studio in North Cambridge. The event was a fun, chill time with great food, ample beverages, and nonstop music. The open jam was a real treat, as various musicians took the stage to form impromptu Led Zeppelin cover bands, cover songs by the Pixies or perform their original fare. I finally got to meet Ryan of Ryan’s Smashing Life fame, see a few friendly faces and a encounter a few new ones. I saw Tab the Band and learned about Zumix, a nonprofit dedicated to helping youth build community through music and the arts (the raffle at the event, featuring donations from bands, blogs and local businesses for prizes, benefited Zumix). Thanks so much to the organizers for bringing us all together on a beautiful day. There was a great sense of community on display — one of the things I like the most about the local music scene. Levi’s has organized the Pioneer Sessions, recruiting artists ranging from Nas to She & Him to the Dirty Projectors to to “re-craft the classic songs that inspired their sound.” You might end up on the Levi’s mailing list, but the covers released to date have proven more than worth the price of admission. Trent Reznor is back and the debut EP by his new project, How to Destroy Angels, is available for free download. At the Boston Rock BBQ, I met Bernie Conneely, who runs the local music scene website Melody Matters. He also regularly records video at concerts, which he posts on the Melody Matters YouTube channel. A locally-developed platform called Riotvine, which finds and aggregates local events and tells you which of your friends have plans to attend, has teamed up with Foursquare to tie in a location-based marketing component. Now, for instance, a band could see who is at a show and reach out to those fans with real-time rewards, such as free tracks. BostInnovation has the details on the partnership, as well as earlier coverage of Riotvine. One thousand dollars can buy you a custom-made Juliana Hatfield song. Miss Lala already? Grooveshark wants to give you a shoulder to cry on with free access to its premium service. Gorilla vs. Bear is among the half dozen music sites joining the BuzzMedia collective. The Grinding Tapes mix CD exchange deadline has been extended to July 2. Bad news for me who really wants to hear everyone else’s mixes, but good news for you if you want to participate in a cool project! I still remember how I felt after writing my first Take Five post after a long hiatus from music writing. The only way I can describe it is that it felt like coming home. Since then, I have committed myself to posting a Take Five post every Friday, and with the sole exception of the week I was in England, I’ve adhered to that plan. But I think I’m ready for the next step. I’m thinking of new dimensions not just for Take Five, but for this blog. And I would love for music writing to play a larger role. No decisions yet, but I just wanted to let you know that my brain gears are turning.